Set limits for trunks, create call restrictions and manage credit balances – all within the App. The Accounts Manager App has consolidated customer relationship management within a single User Interface. 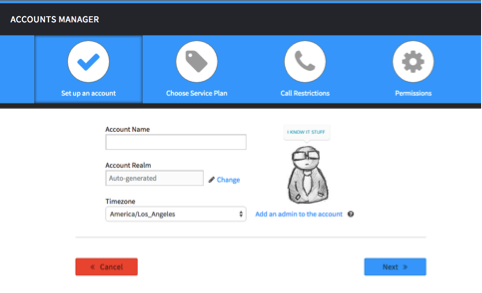 Accounts can be set up remotely, enabling you to sell across the continental United States. You no longer need to worry about logging into separate systems or figure out what client is on which platform. Add and edit new accounts and sub-accounts, monitor customers, select a carrier strategy, maintain service plans and restrictions - in one interface. Set up accounts for all of your customers. Create business account names, add the admin contact or manage the account yourself. 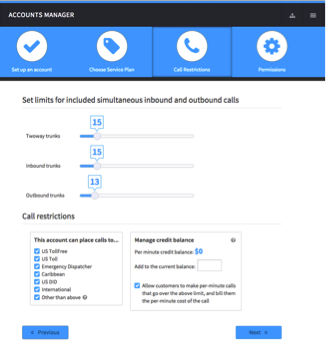 Create and set limits for your customers that include inbound, outbound, and two-way trunks. Set up call restrictions based on tolls, location, Emergency Dispatcher, and manage your customer’s credit balance. Manage what your clients can and can’t view. This includes user and account settings, billing options, inbound and outbound trunking, and UI errors.